Carnival's private label draught beer that debuted in Carnival Magic’s Caribbean-themed RedFrog Pub in May 2011 proved to be such a hit that it was rolled out fleet wide. 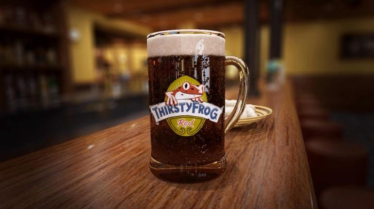 Guests have been lining up to savor ThirstyFrog Red’s rich taste and delicate aroma, with toasted notes resulting from the fine caramel and black malts used during the brewing process. The brew is served ice-cold on tap in the line’s signature ThirstyFrog Red pint glasses, which are also available for sale on board.